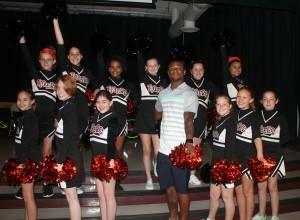 PHOTO: Leonard Johnson, a current Tampa Bay Buccaneers player and former PCS student, takes a picture with the Largo Middle cheerleaders. Photo by Demorris Lee/PCS Communications Tampa Bay Buccaneers nickel defensive back Leonard Johnson made an admission last week. As he addressed students at Largo Middle School, he told them that he had been in the exact situation as the middle schoolers. High stakes testing.